We’d love your help. 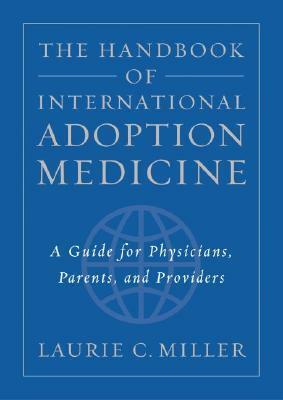 Let us know what’s wrong with this preview of The Handbook of International Adoption Medicine by Laurie C. Miller. Since 1989, American families have adopted more than 230,000 children from other countries. Many of these children have lived in crowded conditions, sometimes with poor standards of hygiene, inadequate nutrition, and limited numbers of caregivers. Some suffer from endemic infectious diseases. Upon arrival, practitioners often fail to recognize the unique concerns of this g Since 1989, American families have adopted more than 230,000 children from other countries. Many of these children have lived in crowded conditions, sometimes with poor standards of hygiene, inadequate nutrition, and limited numbers of caregivers. Some suffer from endemic infectious diseases. Upon arrival, practitioners often fail to recognize the unique concerns of this group. This text provides an overview of the specialized medical and developmental issues that affect internationally adopted children, offering guidelines to the physicians caring for these children and their families before, during, and after adoption. The reader will learn how to advise families prior to an international adoption, how to perform an effective initial screening assessment of the newly arrived child, and how to recognize and manage developmental and other more long-term problems as they emerge. To ask other readers questions about The Handbook of International Adoption Medicine, please sign up. Compassionate and clinical, odd a combination as that sounds. I read it cover-to-cover on a flight back from meeting my children-to-be in Russia. Could not have chosen a more informative or comforting read. Can't recommend it highly enough. This book is a good reference but nearly all the research is on children adopted from Eastern Europe. So if you are a US foster family or family adopting from other areas, it might not be worth the hefty price tag.